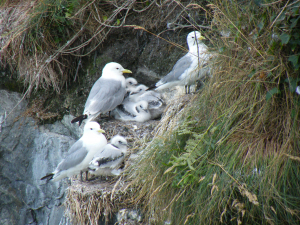 Observation - Kittiwake chicks in Co. Down - UK and Ireland. Description: Adults with young on rock ledges of low cliff. Evidence of better breeding this season. Adults with young on rock ledges of low cliff. Evidence of better breeding this season.